Each year, CrossRoad Christian Academy, invites family, staff, and community to gather together for a delicious dinner and live entertainment to help raise funds for the school. This year we are excited to once again have a silent auction. There are some terrific items that have been donated by very generous businesses and people that believe in CCA’s ministry. The silent auction items are listed below and are open for bids right now. If you would like to support this event by making a donation, please call Donna De la Torre at 310-327-3094. All auction items will be available for viewing online and/or at the event (the Annual School Dinner). Bids prior to the event must be submitted by e-mail to Donna De la Torre, event coordinator, at delatorred@crossroadca.org. You must be at least 18-years-old to place a bid. Serious bids only. E-mail bids must include the Item Number, Name, your Bid Amount, your Full Name, Home Address, the best Phone Number to contact you during the day, and if you plan to attend the event. Attendance in not required. Each bidder will receive an e-mail with the current Highest Bid at 9:00am and 4:00pm each day before the event. This website will also be updated with the highest bid at those times. E-mail bidding will close at 10:00am on the day of the event, November 15, 2012. Bidding will continue at the event from 6:30pm until the close of the event. Persons that send e-mail bids do not need to be present to win, but we would be honored by your attendance. Click here to print a ticket registration form. The winning bids will be announced at the end of the event. Items can be claimed as soon as the bid amount is paid. Winning bids paid by check, depending on the amount, may require a few days to verify the funds. Donated by: Carlo E. Lomeli, owner. Details: Located at 2223 W Redondo Beach Blvd in Gardena. 310-323-7993. Donated by: Ben Bonello, owner. Details: One large pepperoni pizza. 16006 Crenshaw Boulevard in Gardena. 310-327-0355. Details: Six reserved seats in the first row of CCA's 2012 Christmas Program (grades K-8th). Friday night on December 14, 2012. Details: Six reserved seats in the first row of CCA's 8th Grade Graduation Ceremony. Tuesday night on June 4, 2013. Details: Two Complimentary Admissions valid through 3/31/2013. 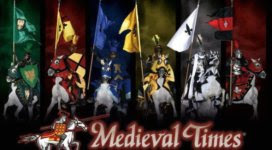 Details: Complimentary admission for 2 to the Medieval Times Buena Park. See website for more information www.medievaltimes.com/buenapark.aspx. Details: Gift card accepted at King's Hawaiian Bakery & Restaurant and The Local Place. For directions visit www.kingshawaiianrestaurants.com. Details: Basketball with signed by Lakers #27, Jordan Hill. includes letter of authenticity. Details: Four tickets to any one of the Sparks 2013 regular season home games from May - September. Paddle Boats, Kids Play Area & Miniature Golf. Details: One month of FREE dance lessons, one Webby Dance sweatshirt (child’s large), one Webby Dance T-shirt (child’s medium), one Webby Dance Pink Canvas Bag.